Our favorite family recipe! 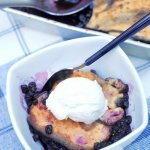 This fluffy cake-style gluten free blueberry cobbler is a guilt-free version of the classic summer dessert! I participated in Mom Blog Tour Natural Products Expo West (#MomBlogTourFF) on behalf of Wendy’s Bloggers. I received Wyman’s of Maine products to facilitate my review, but my opinions and creative content are my own. My uncle grows blueberries, and every summer he’d bring buckets of them to the beach or wherever our family gathered. Needless to say, we ate lots of blueberries and blueberry based recipes, like pancakes. 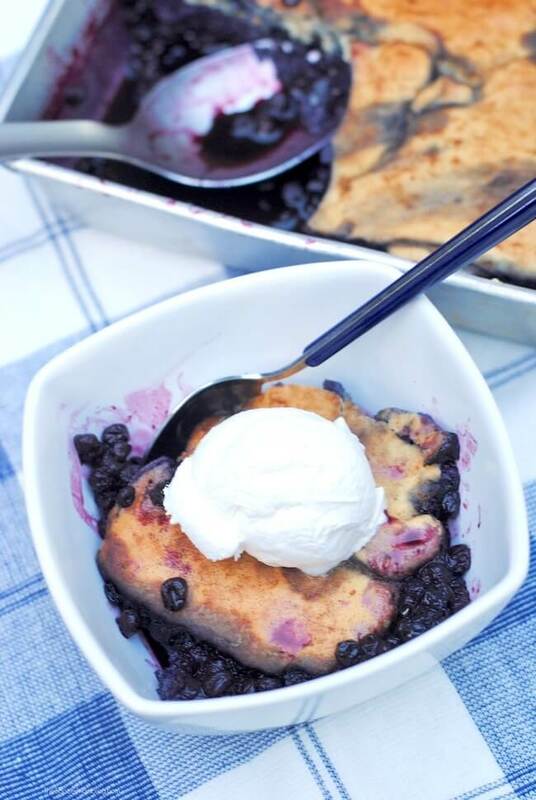 However, the blueberry cobbler was always the star of the show! 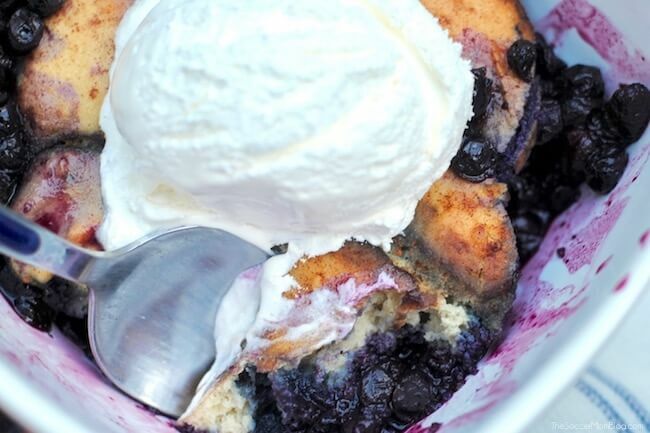 My aunts make a cake-style blueberry cobbler, with a fluffy pancake-like topping. In my humble opinion it’s the best! Craving a taste from my childhood, I asked my husband to re-create our family’s recipe, and make it gluten free so I could enjoy as much as I wanted. As always, the hubby did a spot-on job — his gluten free blueberry cobbler tastes just like how I remember it! I’m so excited to share the recipe with you! 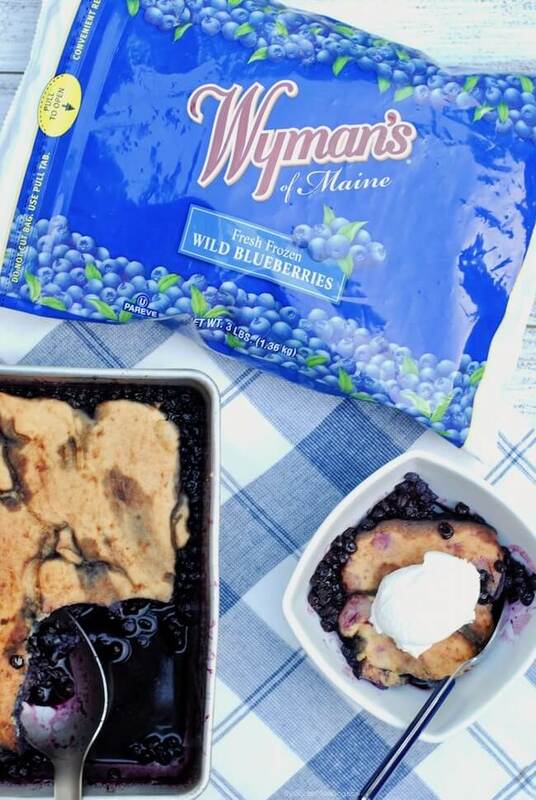 Since my uncle lives thousands of miles away, we used Wyman’s of Maine Fresh Frozen Wild Blueberries for our cobbler. What is the Difference between Wild Blueberries and Cultivated? Cultivated blueberries are what most people picture when they think of a blueberry. They are commercially farmed and often selectively bred to produce larger fruits. Wild blueberries grow naturally in what are known as “barrens” in Maine and Canada. They’re not planted or genetically modified. Wild blueberries are smaller, and have a larger skin-to-fruit ratio, so they provide a more intense flavor and pack more nutrients (contained in the skin). High in Fiber — One cup of wild blueberries contains 25% of the recommended daily value of fiber. Excellent Source of Manganese — This mineral aids in bone development and key body functions and one cup of wild blueberries has over 200% of what you need in a day! Packed with Antioxidants — Antioxidants are crucial to help neutralize free radicals, which are molecules that damage our body’s cells and may lead to cancer and heart disease. Wild blueberries are one of the top fruit-based sources of antioxidants. Wyman’s of Maine was founded in 1874 and is a family-owned business. They’re known as a leader in growing and harvesting wild blueberries – and it shows in their product! In addition to Wild Blueberries, Wyman’s also supplies superior quality Frozen Blackberries, Raspberries, Strawberries and Mangoes, sourced from family farms in the U.S. and abroad. Learn more about Wyman’s of Maine and connect with them on: Facebook, Twitter, Pinterest, and Instagram. Giveaway Alert: Keep reading after the recipe to find out how to enter to win $1500 of healthy foods and products from our sponsors! Keep reading for photo step-by-step directions and prep tips or click here to jump to printable recipe. 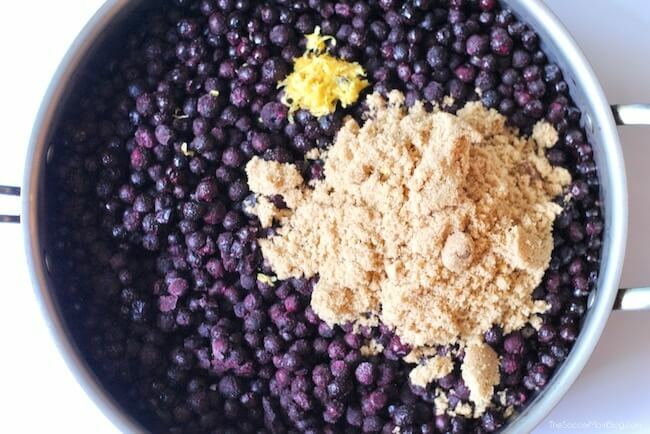 Combine blueberries, brown sugar, lemon juice, and lemon zest in a large sauté pan. Simmer 45 minutes over medium heat, uncovered. While blueberries reduce, make a double batch of our gluten free pancake batter. (This is my husband’s gluten free pancakes recipe and it is seriously the best ever). Set aside. Butter the bottom of a 9 x 13″ baking pan (you can use either oven-safe glass or a metal pan, depending on what you have). 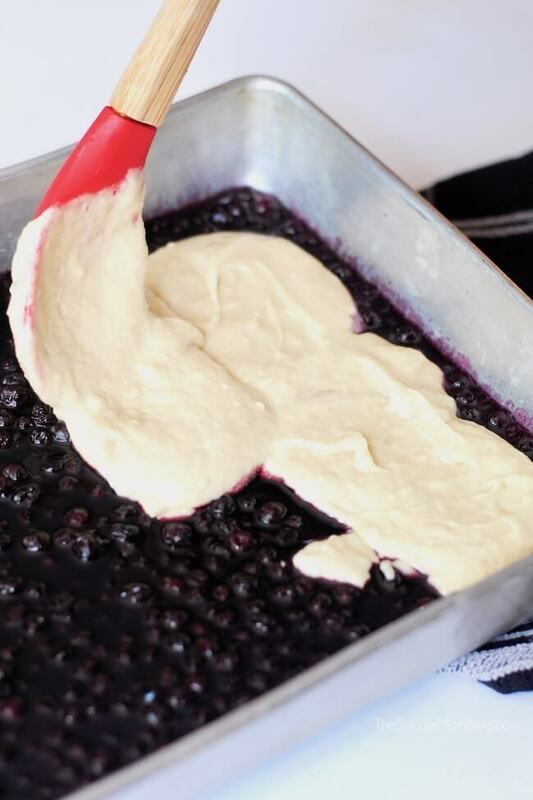 Pour blueberry mixture into pan. Spoon pancake batter on top of blueberries, carefully as to keep the layers separate. Remove from oven and brush the top of cobbler with butter. Sprinkle with cinnamon, if desired. Return to oven and bake for an additional 10-15 minutes until top is a light golden brown. ur favorite family recipe! 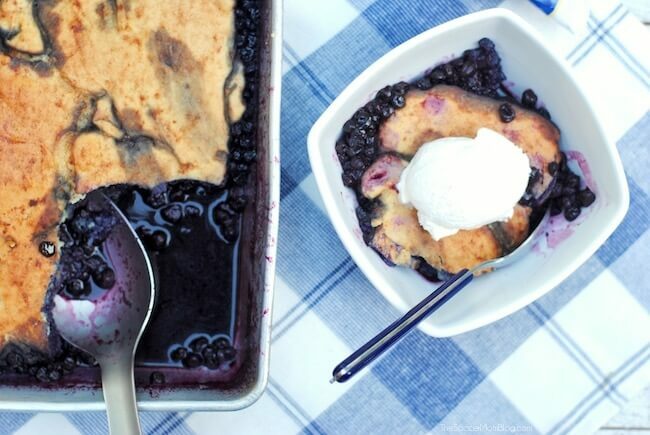 This fluffy cake-style gluten free blueberry cobbler is a guilt-free version of the classic summer dessert! While blueberries reduce, make a double batch of our gluten free pancake batter and set aside. Butter the bottom of a 9 x 13" baking pan and pour blueberry mixture into pan. Spoon pancake batter on top of blueberries, taking care to keep the layers separate.